When you’re living on your own, there’s a certain freedom that comes with decorating your home. No compromises are made on your personal style, and nothing stands in the way of your vision—as far as resources will allow. For designer Jillian Dinkel, this made her recent bachelor pad project extra enticing. With a final result that includes several impressive custom pieces and built-in moments, this home is tailor-made to its inhabitant. This Sydney apartment is a master class in styling a home that doesn’t compromise on style, even when space might be limited. Below, apply the five tips we learned from this space to your own home. Since the kitchen is fully in-view as soon as you enter the apartment, Dinkel opted for a dramatic paint job. “The bottom cabinets are custom, finished in a deep blue-black, which gave great contrast to the light oak floors as well as adding a masculine edge,” she says. 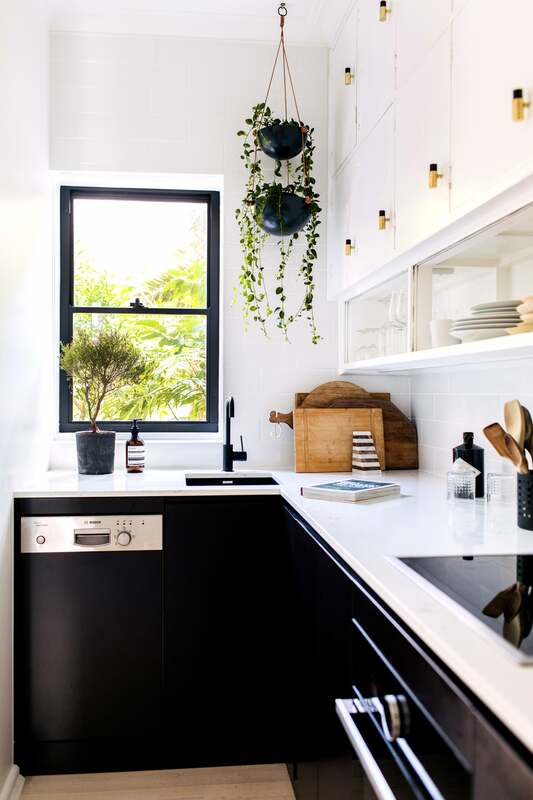 “We went with black appliances, faucets, and a sink to complete the look.” The preexisting upper cabinets were simply given a fresh coat of white paint to make them pop. The differing hues of these upper and lower cabinets give the kitchen a more spacious feeling, in addition to making a major statement, proving that a bit of contrast can go a long way. An exposed closet can be extremely motivating when it comes to keeping your space neat and tidy. For this home, a custom-built unit made for a small-space solution that had the added bonus of making a dynamic visual statement. Just because your yard doesn’t have a ton of square footage doesn’t mean it can’t become a versatile hangout spot that can fit plenty of friends and family. Here, Dinkel saw an opportunity to create a totally original deck: one that makes up in vertical space what it doesn’t have in horizontal space. “The back courtyard of this apartment was small but had such potential. It had been plagued by some weird decking—that we later learned was to conceal old water pipes—as well as an overgrown and neglected garden and a random concrete pillar,” Dinkel explains. “I proposed extending the deck with a tiered approach to avoid having to relocate pipes and allow for different zones to be created.” Stairs make one satisfying small-space fix. It can be tricky finding a storage-minded piece that can reflect your taste, which is why the designer ended up devising a custom piece for this entryway, complete with leather handles, steel legs, and a marble top. Just because a piece is functional doesn’t mean it can’t also stand out design-wise—small accents like knobs and surfaces go a long way to making this kind of piece feel special. Sure, remodeling and renovating a home will always make a massive impact on the way a space looks and feels, but that’s not to say that the little details aren’t important too. “Art always makes a big difference in a home,” Dinkel says. “Steve and I collaborated to make most of the art in the home, and he had some great concert posters that we salvaged and had framed. In addition to that, little treasures from some my favorite vintage shops and ceramicists give a very warm feeling to the reclaimed railway sleeper shelves in the dining nook.” Whether a major reno is in your cards or not, never underestimate the power of a new trinket or a framed print.